Findlay Market - operated continuously in the same iron-framed building since 1855 - is not just another historic monument. It is an essential institution to life in 21st century Cincinnati. Linking Uptown with downtown, Findlay Market is a vibrant living landmark at the heart of Cincinnati's future. 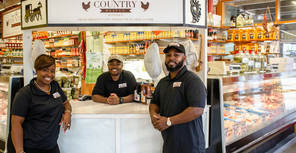 Our Mission: Historic Findlay Market connects farmers, producers, sellers and customers in a dynamic, diverse public marketplace. Our Vision: Historic Findlay Market is our region’s premier destination for local food and artisan products, a dynamic public gathering place, and a vital community asset. Authentic: We value genuine human connections and social interactions that a vibrant, dynamic public marketplace promotes. We value the diversity in all definitions that exists among our merchants and our shoppers. Value-minded: We believe in providing our shoppers fresh, high quality foods at fair prices and a rich product array that will satisfy a wide range of shopper needs. We provide an inclusive shopping experience that is unparalleled in our region. Entrepreneurial: We create a supported environment for diverse startup businesses and the growth and sustainability of locally owned and managed businesses. Responsible: We honor our role as stewards of a thriving landmark and demand integrity in our interactions with our shoppers, merchants, employees, volunteers, and community partners. Today, Cincinnati's 19th century public market is reinvigorating the city's 21st century urban core. In the future, when we achieve our mission and realize our vision - when Findlay Market is fully revitalized - perhaps some blogger, reporter or travel raconteur will write a description of our city's historic public market that reads something like the following. "Findlay Market is the most colorful, vibrant public space in Cincinnati's flourishing downtown. The market is a leading catalyst transforming Cincinnati from an older industrial city into a dynamic, prosperous urban destination for well educated young people, creative class professionals, Fortune 500 companies, and new-economy businesses. Findlay Market is the social and economic centerpiece of its unique, nationally renowned downtown neighborhood, Over-the-Rhine. There, historic architecture, walkable safe streets, a 19th century human-scale cityscape, and a remarkably diverse population attract legions of new residents from throughout the world. Connected by modern electric streetcar to both the central business district and to the university and medical research centers Uptown, Findlay Market is crowded with people of all races, ages, incomes, and ethnicities late into the evenings and all week long. It is the anchor of a thriving cafe and culinary district spreading steadily out along the streets surrounding the historic market house. Across America, when people think or talk about Cincinnati, they think and talk about Findlay Market." "Millions of shopping visits are made to Findlay Market each year, bringing tens of millions of dollars in consumer spending to the public market and other retailers downtown. Most businesses operating at the market are locally owned and they are growing and profitable, making Findlay Market one of Cincinnati's most desirable locations for mom and pop shops. The market is the destination of choice and primary source of nutritious fresh food for tens of thousands of downtown residents who walk, bicycle, and ride the streetcar to shop its scores of merchants. The market is a robust business incubator and, each year, a few new enterprises survive and thrive. Nearly a thousand people are employed full-time and part-time by market merchants, among them scores of young people working their first jobs. The market provides more than a hundred local farmers, including dozens growing food inside the city limits, with lucrative sales outlets through its farmers markets and wholesale produce auctions. Findlay Market's fabled weekend street bazaar attracts scores of local crafters, peddlers, street performers, and immigrant vendors in its vigor and diversity, it rivals the street markets of Europe and Latin America." "The considerable economic benefit Findlay Market creates in downtown Cincinnati is matched by its cultural and environmental contributions. Dozens of musical performances, art exhibits, poetry readings, political speeches, street theater acts, public art installations, and community events are mounted each year at the market. Findlay Market's sustainability initiatives to compost or recycle its solid waste, plant trees and flowers, manage litter and graffiti, promote green-historic renovation practices, reduce atmospheric carbon, embrace conservation, incorporate alternative energy sources, support urban agriculture, and strengthen local food systems are models for public markets and urban redevelopment around the country. Because of its essential role in transforming Cincinnati's urban core to embrace 21st century environmental imperatives, economic needs, and lifestyle aspirations, historic Findlay Market - a truly living landmark - has reasserted its centrality to life in the Queen City and forever assured its future as one of Cincinnati's most cherished and broadly supported institutions."